Are questions about legacy products inherently off-topic? For instance we regularly get new questions about windows-server-2003 which ran out of extended support in July 2015. If even the vendor no longer provides support, why should our community? No, each question should be judged on its own merits. Although we all agree that life-cycle management is important, its is also difficult. Good questions about legacy products are welcome. The appearance of EOL stuff in a question is clearly not dispositive. On the other hand, if the use of EOL things in the case given is unreasonable or even stupid, such as when the asker is setting up something new with EOL things that are clearly wrong for the job, we have a close reason for that. The use of EOL junk can totally be the lack of "reasonable" practice, barring some justification. Old! $technology went out of support on $date - if you can, you really should upgrade. Your security and maintainability will be greatly improved. We don't purge questions about something just because it went out of support, so there is clearly no reason to prohibit new ones altogether. Sorry to interfere with the poll! To be honest I'm kinda torn by this. I know people who are still using WfW 3.11, they will continue to do so for the next decade or so too. They knew this would happen when they started the project and took appropriate actions. From a hardware perspective they bought sufficient extra to last them the lifetime of the project. From a software perspective they got stable with the platform and developed their programs against it. Any bug that may turn up will get fixed against the same platform or the program gets migrated (at considerable cost) to a newer more supported platform. These guys are good - we will never see a question from them. If someone asks a question about maintaining a legacy environment then it's helpful to answer it. If though, someone is developing with a legacy environment then it is not helpful to answer it because using a legacy environment for something new is the wrong thing to do. 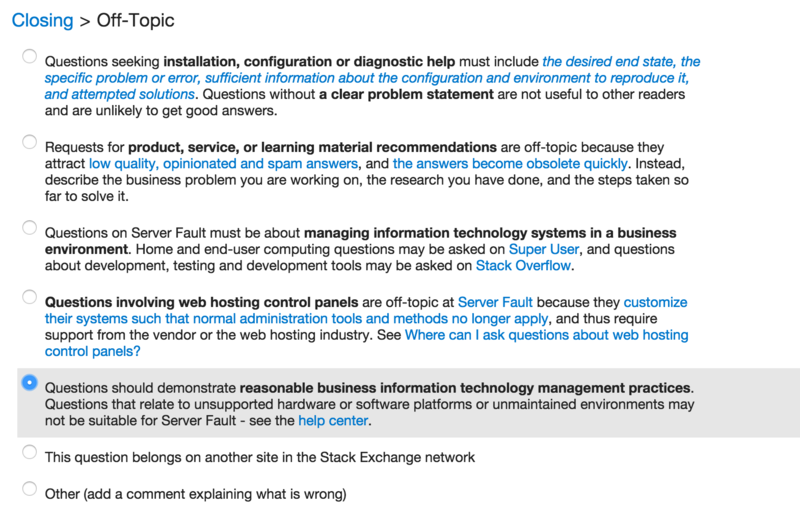 It should be closed off topic with the reason: Questions should demonstrate reasonable business information technology management practices. We are not the internet's support safety net. No, I think the concept of "legacy" is too nebulous to make a strict rule on this. End-of-life dates are not the same for everyone. For example, even Windows XP is still supported by Microsoft -- just not on desktop machines. Windows XP Point-of-Sale Edition still gets regular updates. Yes, legacy products are off-topic. When are legacy/unsupported systems still on-topic?